In July, DB Consulting Group, Inc. (DB) and DB Cares were chosen as the first winner of Bell Flowers’ Community Appreciation Month contest. Bell Flowers created the contest as a way to thank businesses and individuals that have contributed to the community. 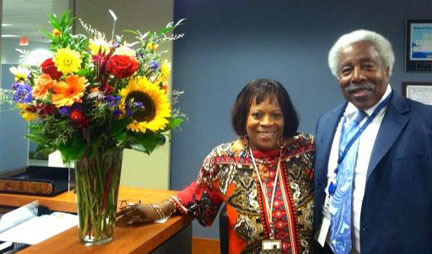 Barbara Triplett and Gerald Boyd, Sr. pose with the bouquet of flowers that was presented to DB Consulting Group, Inc. and DB Cares in recognition of its community giving and outreach efforts.